Mike, in a chuckling but supportive way, calls what I’m doing “playing cowboy”. He does all the dirty work and sometimes gets to enjoy the fun. I’m having fun house-sitting and watching a little bit of the farm. Really I’m watching the remaining expectant heifer — she’s a first time momma and Mike assigned me to periodically check on her. Mike had kept the two heifers penned in an area just above the barn for the past week. A couple of days ago Mike decided they were close to calving and he moved them to nice grass below the barn. He reasoned the calves would be better off born on the grass than in the mud. One of the heifers calved mid-morning today. Today, just in advance of a huge lightning storm, Mike and I went over and moved the heifer up the hill to the barn. If she needs help, Mike figured, he wouldn’t be working on the hillside in a huge lightning storm. Every couple of hours I ride the four-wheeler 1/2 mile to the barn and look in on this Limousin heifer. She seems ready to pop but is holding out for some reason. So I slowly saunter into the barn without angling toward the heifer and I start talking to her. I am absolutely clueless what will work but I pretend I belong and know what I’m about. She isn’t fooled. She watches me as I cluck and chat with her. I am only there to see if she is laboring and okay. This is interesting for me and I am enjoying the novelty. Different tasks, not much dirty work for me as I just find the girls and report back to Mike if I find anything wrong. She might find me interesting too. I think she sees through me, knows I’m not the real Mike. The real Mike is the excellent cattle farmer, knows how to manage one-on-one or manage the herd. He can herd the cows on foot or with the four-wheeler equally comfortably. It looked like he was working the cows with a quarter-horse today as he dodged and darted to guide the heifers up the hill toward the barn. I have used the four-wheeler to run back and forth to the barn and cruise a couple of the fields. The handling on asphalt is a little dicey with the flotation tires, and the terrain unknown under the carpet of grass. But Mike zips around on the four-wheeler like he has been on it for years. And he apparently has — he told me this Honda four-wheeler is over twenty years old and he has had it more than ten years. Mike serves as the cattle-man, farmer, veterinarian, investor, psychologist, and so many other roles I wouldn’t even know. He definitely knows his way around this business of raising Limousin cows. He isn’t playing cowboy — he’s the real deal. Where in the world is Ramsey, Illinois? Ramsey, Illinois, is in the middle of farmland and pretty much nothing else. Ramsey has churches, schools, a volunteer fire department, a convenience/gas store, and a grocery store. And it is surrounded by farms. This seems the model midwest small town. Mike and Janet have built their lives here, raised wonderful children and have ten (I think I counted right) grandchildren within reasonable driving distance. We have been staying in our Airstream on a farm several miles south of Ramsey. Janet and Mike dug a pond, sunk a well, built a house, and established a successful cattle farm. They raise Limousin Cattle and keep a little under two hundred head. We’ve been treated to sights of day-old calves and a pair of heifers just about ready to calve. We may see another pair of calves any day. I’m sitting on Janet and Mike’s back porch listening to two double-bass bullfrogs competing across the pond. What seems like a thousand tree frogs are chirping throughout the trees. A whippoorwill sings his song for five unbroken minutes. A little later we’ll hear a bobwhite singing his “bob-white, bob-white”. Then we won’t hear a sound for six or seven hours — we are sleeping so well. Janet and Mike have had a their children visiting during the past several days so I have tried to stay a little out of the way. Friday morning Mike and I used my slingshot to shoot my 20 meter ham radio antenna high up between two of their trees. The copper dipole antenna is fifty feet above the ground, tied with parachute cord tightly between the trees high above our trailer. I am now listening to a ham radio operator, 4Z4UR, near Tel Aviv. Each time he calls “QRZ”, or “who is calling me”, I try to time my response so it will stand out among the dozen or more competing stations trying to obtain a brief conversation with Ehud. This may not work out for me but would be my first Middle East contact. It is easier to spin the radio dial through the bands and find someone just starting to call for responses. The pile-ups won’t have started and I can punch through well. Two nights ago I reached Sicily and Spoleto, Italy, southern Poland, Netherlands, southwest Germany, and northern Germany. This dipole antenna is working for long distance more than twice as well as my rooftop vertical antenna. I cannot always find such outstanding trees situated just where I want them for the dipole. The trees must be tall, have openings in the canopy for the antenna ropes to reach, and the trees must be between 75 and 150 feet apart. It’s fun when I can hang a dipole antenna, to try and reach far away stations I cannot usually work. The moonlight barely filters through the trees, shifting around as the breeze moves the leaves about. It is very dark when we turn out our light — there are no other man-made lights visible to us. This is a beautiful place, very quiet except for sounds of nature. I didn’t get the Israel station — too many stronger stations over my signal strength. I switched to another band and promptly made two-way contacts with Italy and northwest Germany. Tomorrow morning Mike is driving Janet to the hospital for a lengthy surgery and hospital stay. Your prayers will help. Today we took a big drive, 260 miles, to arrive at Cecil M Harden Lake in Indiana’s Raccoon State Recreation Area. This puts us close to Effingham, Illinois, where we want to visit friends. Along the way, at our sole gas stop, we weighed the trailer on and off the truck’s hitch. We’ve weighed several times before, maybe twice yearly. The weights have previously been with truck and trailer connected via the weight-distributing hitch. This hitch transfers some of the trailer’s hitch weight to the truck’s axles and to the trailer’s axles. Weighing the trailer separately provides us, for the first time, an accurate weight of the trailer’s weight at axles and at hitch. Fortunately, we are right on the money with our axle loading and with our hitch weight. The hitch weight is exactly 1/7, or fourteen percent, of the trailer’s weight. Unfortunately, we have no spare capacity unless we remove some heavy things from the trailer or replace the axles with axles of higher capacity (3,500 pound axles would afford an added 1,000 pounds to our trailer’s capacity). If I decide I need two more solar panels atop the roof, I will need to find equivalent weight in the pantry, linens storage, or other items, to remove first. We’ve already started talking about what we can remove entirely or move from the trailer to the truck. The truck is well underweight and also is rated for 20,000 pounds gross combined weight. So we could, if we just had to, carry more in the truck. We’ll do the separate weighing from now on — it provided the best look at what we are doing with our loading. The drive was easy, big state highways, except we only had one poorly paved lane much of the way due to roads and bridges construction. This would have been fair enough, but we made a pair of goofs in our navigating. We learned eighteen months ago not to fully trust the directions from our GPS — the GPS has the sole mission of delivering you directly to your stated address or point of interest. Unfortunately, the direct route may be out of service, or one way against us. Perhaps worse still, the address we plug in may be correct but not unique. In none of these cases will the GPS outsmart us and still deliver us to the place we wanted. Eighteen months ago we plugged into our GPS the address for the Cades Cove National Park campground. The address was correct and our GPS did her best to take us there as directly as she thought she should. But the route was barely navigable with our truck/trailer and at the mountain’s pinnacle, after innumerable switchbacks, the park’s road is one-way out of the park only and a locked gate, to boot. Okay, lesson learned! Today we plugged into our GPS the address for the Raccoon State Rec Area and off we launched. We saw, toward the end of the day’s distance, encouraging signs directing us to Raccoon State Rec Area. Repeatedly our GPS directed us to turn off the highway at this county road and that county road. We persevered, believing we should wait for another big brown Rec Area sign and perhaps a more major road instead of these unpaved county roads. Soon, we found the major road and took it into Rockville, Indiana. Encouraged, we followed our GPS as she directed us down the state route toward our address on Raccoon Parkway. We are no longer seeing any brown signs. The road doesn’t seem very parky, either. We again stay the course, thinking the park entrance must be just around the next bend. And around the last bend we encounter a gorgeous old 1800’s covered bridge, and our GPS announces we have arrived at the dead end private farm road just ahead. Right address, wrong Raccoon Parkway. Had we taken the time we could have checked through her very many turn instructions to look at her map of the last turn. We would not have seen any lake within six or ten miles, an immediate clue we might not have the correct destination. Then again, we wouldn’t have seen this great looking old covered bridge. But we probably would have encountered another somewhere nearby — Parke County claims to have more covered bridges than any other county in the United States. And we would have missed the big old junkyard nearby. And we would only have driven through Rockville once, instead of twice. We arrived to the State Rec Area’s campground less than an hour later than planned, none the worse for wear. This is a pretty and large campground. We have a cul de sac camping loop to ourselves except for a few groundhogs bopping around. The nearest other campers are 1,000 yards away. The campground has almost 350 campsites in seven or eight major areas. We selected a primitive one for the great price — $8/night. The registration clerk asked us, “Don’t you want to be close to the showers and flush toilets?” We walked an hour touring the entire campground later, after we had set up camp and cleaned ourselves up. The campsites in our loop are vastly more level than many of the more expensive ones. Our loop is far quieter and cleaner. We picked well. We’ll continue to “watch our weight”. It can help with gas economy and is better on our trailer’s tires and suspension. We like keeping things a little simple anyhow. And we are properly chastised by our GPS for our carelessness and for our blaming behavior. When she took us way down the wrong road we were sure she had screwed up. We are reminded, again, to check twice and drive once. Our week in Bay City, Michigan visiting with friends Al & Darlene was wonderful. The weather was cool and partly cloudy, with a few days getting to the high 60’s or low 70’s. The nights were cool and very pleasant, around 50 degrees. Everyone we met tells us, “This weather is unusually cool.” It was so nice we didn’t mind at all. Deb and I slept almost impossibly close to each other. Al & Darlene provided us a great introduction to Bay City, with visits to the river walks, downtown, a few special stores, and the casino. The River Walk and Rail Trail afford level, long, and scenic walking and before we knew it we had walked six miles. It was fun seeing this area so different from our North Carolina piedmont. A loud noise attracted our attention to the water and we saw a tiny orange blob zipping along. We watched this very cool F1-style speedboat racing back and forth on the Saginaw River, and a bunch of men fishing for catfish from the riverwalk, and enjoyed a day of fantastic weather. Friday morning we visited a gaggle of rummage sales in the adjacent development. We found a whole lot of things worth the price but not worth their weight. And we found a few things worth their weight and price, like a dozen Titleist golf balls for $2 and three good paperback books for 75 cents. More interesting for me was seeing the landscapes — similar to areas of the Pacific northwest, I find the plantings and architecture very appealing. Of course, it helps a lot everything is springtime green. Saturday morning we toured the old old money neighborhoods on Central, with houses from the late nineteenth century. Early days of Bay City found the lumbermen building gorgeous and grand mansions all heated, by the way, with fireplaces. Al and I decided the old-time fireplaces were designed for holding and radiating heat whereas the fireplaces now allowed by building codes are so deep and short as to reduce greatly the radiated heat. Hopefully these old houses had great heat from theirs. We found, along one of the backstreets, an old-time baseball game between an Akron team and the Bay City team. The players were all catching and fielding balls bare-handed. Debbie and I were surprised at the great hands the infield and outfield players had to field the balls barehanded. The catcher’s backstop was a short stack of hay bales and the umpire did not stand behind the catcher. The ump did not call balls and strikes, and the fly-outs didn’t automatically force a player to tag up. Instead, any advancing base runner must return to, and stop at, his former base. Oh, and the uniforms — all the players were in authentic-looking old-time baseball team outfits. The game was fun to watch, even if the Akron team did defeat the home team. Sunday we attended Mass with Al & Darlene, my first Catholic Mass except a niece’s wedding two years ago. I thought the church interior is pretty modern looking, for a Catholic church. And the worship service was really nice, with great voices and piano and with a short, sweet, and direct message from the priest. We liked the service and the church. Hmm, if we live here would we consider joining the Catholic church? After church we toured Tobico Beach and Tobico Lagoon areas and the Bay City State Park. Al showed us where, when he was a teenager, they would go to the shore and watch the submarine races. Lake Huron has since receded hundreds of yards and is separated from accessibility by marshy wetlands. Monday was rainy and cool so we stayed close to home. The girls did a little shopping, read the paper, and Darlene cut Debbie’s and Al’s hair. Al and I rebuilt my ham radio stand and the capacitor clamp atop my radio’s power supply. The stand was fun because we drilled and tapped my thick aluminum plates, everything lined up very well, and the newly rebuilt stand works much better than before. The hinges formerly were two thicknesses of duct tape and were plainly floppy. The radio faceplate attached to the stand with two-face foam tape and was a little wobbly. And the bracket to hold the bracket at the correct viewing angle was also stuck with foam tape. Now the hinges and faceplate are attached directly with 4-40 or 8-32 machine bolts, and the tilt angle is adjustable with a pair of bolts in the hinge joint. Everything is drum-tight, looks good, and works great. 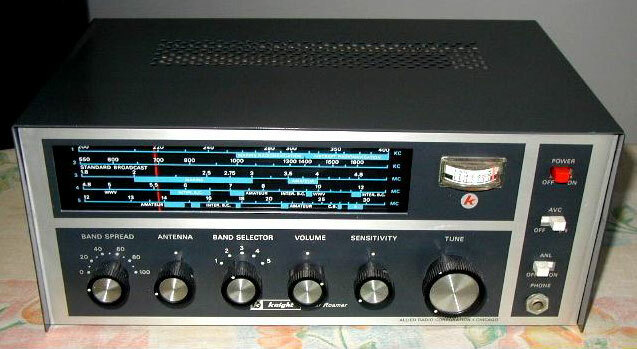 Then Al pulled an old Knight Star Roamer shortwave receiver radio from his shelf. We dusted off the radio and test-fired it — after decades on the shelf it warmed and sounded fine, if with a bit of static. So we took the radio to the front porch and attached to it a G5RVjr dipole antenna pulled between two maple trees. Immediately we had great results — we pulled in Radio Prague on 7 megacycles and a number of other recognizable stations on many other bands. Al built this Allied kit radio in 1963 as part of an electronics correspondence course. The radio is a five bander covering aviation (200 to 400 kilocycles) and broadcast bands (500 kilocycles to 1800 kilocycles) and 1.8 to 30 megacycles. Despite our less-than-ideal antenna configuration, his radio had no problem pulling in the stations. What will Al be able to hear when he attaches a 100 feet long wire antenna in his attic? Tuesday I drilled a 7/16″ hole between the exterior refrigerator access and the back of our dinette bench. I fished a piece of coaxial cable through and coiled an end under the dinette bench. The other end has a UHF connector and will rest in the refrigerator access area. I’ll attach a UHF connector to the interior end and attach this coax cable to a Diamond switch we bought last month at Hamvention in Dayton, OH. My rooftop vertical antenna (High Sierra 1800pro) will attach to the other input. The switch output will attach to my radio. I can choose between either antenna with a twist of the switch without unscrewing and reattaching any connectors. Normally I will select the rooftop vertical for receiving and sending on amateur radio bands. Most of the time I use our rooftop vertical antenna because I can raise it and in fifteen seconds be receving. But the dipole antenna generally will provide me much better transmitting and receiving. Sometimes (not often) I can hang my dipole antenna between poles or trees and will be able to connect the dipole antenna to the UHF connector in the refrigerator access. The Diamond switch allows me easy and quick selection of whichever antenna provides the best strength for a given signal. I’ll look forward to trying this out sometime soon. We all piled into the van and Al drove us downtown to see Bay City. We visited St Laurens Brothers, Nuts since 1904, and enjoyed browsing their huge collection of chocolates and nuts they prepare on site. We then walked downtown’s streets and river walk area for a couple of hours. After a quick trip home for lunch we again piled into the van and Al drove us to Frankenmuth. We walked the beautiful covered bridge, visited many shops in the little Bavarian shopping village, and walked the shops along the Cass Street. It was fun visiting and sampling among the cheese and ice cream shops. Good thing we had lunch or we would have snacked way too much. Did you know Frankenmuth was founded 1845 by fifteen German Lutheran monks from Bavaria? They reportedly immigrated to teach Christianity to the Chippewa Indians. The Frankenmuth Brewery started business in 1862, followed in 1894 by the Frankenmuth Woolen Mills. Gotta keep those priorities straight, eh? A visit to Frankenmuth would not be complete without stopping by Bronner’s Christmas Wonderland, the size of 1.5 football fields and with more than 50,000 ornaments and pieces for decorating your Christmas. Our touring day was drawing to a close after walking downtown Bay City and shopping much of Frankenmuth so we almost skipped this. We parked in 15 Minute parking so we wouldn’t tarry and still spent a half-hour visiting beautiful displays and each picking our favorite decorated tree. Next time I’ll be more enthusiastic — I want to return to see what I missed. It has been a lot of fun visiting with Al & Darlene. They are a very young-at-heart couple who like to play. and are good at, a wide variety of table games plus ladder golf, ping-pong, and walking. The visit has been wonderful. Now we head west to Lake Michigan then south toward Ramsey, Illinois.